Absinthe has a reputation as being a drink that is highly addictive, drives people mad and makes them do terrible deeds. As a consequence it was banned in France in 1915 (following earlier bans in Belgium, Brazil, Switzerland and the Netherlands). Absinthe was a very popular drink in France around the end of the 19th century, to the extent that the time around 5pm became known as 'the green hour'. It was made by distilling anise, fennel, and the herb wormwood. It was wormwood that was blamed for its effects. In reality, absinthe was often made with other additives - including copper and zinc to enhance the green colour, and methanol was also often found in absinthe. It is quite possible that these additives were the cause of the problems attributed to absinthe itself. However the oil from wormwood plant is also very toxic. 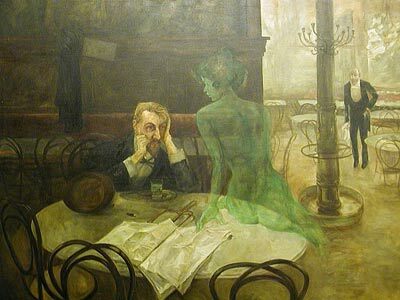 The contributions of artists such as Zola in L'assommoir, and various criminal cases in which absinthe was implicated, all led to the public image of absinthe as being an evil and terrible influence on society. It is hard to tell after all this time, but there is little reason now to accept that absinthe was the terrible product it was portrayed to be - more likely the reputation was founded on misinformation, and the temperance lobby. Pour 1/5 of a glass of absinthe. Hold a sugar cube in a slotted spoon, and pour cold water slowly over the sugar until there are three parts water to one of absinthe. The clear green liquid will have become cloudy. Enjoy! Absinthe remained unbanned in some countries, and has had a bit of a fashionable renaissance in recent years. The original absinthe production company at Pontarlier - which changed to pastis production in 1915 - now produces absinthe once again. The replacements resemble original absinthe to varying degrees, but are free of the curious additives that blighted the original. Most countries have repealed their bans, and even France now sells absinthe related drinks, under certain restrictions to do with the levels of oils from wormwood that are found in the drink.